Lubritex is a key participant in the Aden Free Zone project. It is designed with the latest international technology to maximize blending flexibility in respect of product volumes and types. It has a blending capacity of 40,000 metric tons per annum. Lubritex uses state of the art equipment and implements world-class operational procedures (prepared under agreement by CALTEX) for quality blending and testing. It has a blending control system that facilitates whole blending in automatic mode. 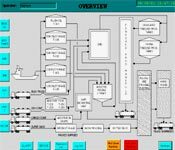 The system is based on the process control applications Siemens Step 7 language, taken from the Siemens S7 system. This means the system can accurately control the addition of components measured using load cells, Mass Flow or PD Meters. The system controls a large range of other devices such as mixers, heaters, pumps, valves and pig stops, as well as metering pumps (for PPM components). 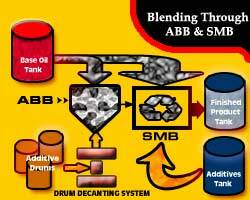 Thus this blending control system has the flexibility to control a number of different types of blending systems including Automated Batch Blending (ABB) using load cell mounted vessels, and Simultaneous Metering Blending (SMB). All lines are piggable to avoid contamination. The Masterfil Weigh Filler is fully programmable to avoid any loss in volume. This consists of three blow molding machines. It has provision of manufacturing 1, 4 and 5 liters capacity bottles. UV machine is used for durable and long lasting printing. UV has a shinier finish than standard inks and is resistant to ultra violet rays, hence the inks do not fade if kept in sunlight for long periods. Pressure testing is carried out to avoid any chances of leakages. It has a capability of printing in multiple colors. follow the standard procedures for conducting batch testing and certification of blended products. 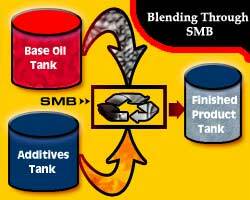 establish a systematic approach of identifying, analyzing and reporting blending related non-conformities during batch testing and certification of blended products. conduct different methodologies for correction of product in the kettle blend so that they meet required specification. The testing capabilites of our lab are as follows.